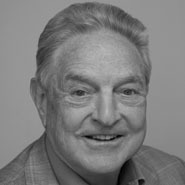 George Soros is an American investor, businessman, philanthropist, and political activist. Born in Hungary, Soros survived the Nazi occupation, fled to England in 1947, and moved to New York City in 1956. Following his graduation from the the London School of Economics. Soros' work in investing and currency speculation has influenced his views of globalization and democratization. He founded one of the first hedge funds and became one of the richest people in the world. Soros created the Open Society Institute in 1993, a grantmaking foundation that aims to shape public policy to promote democratic governance, human rights, and economic, legal, and social reform.